This is the official web site of Prairieland Koi & Pond Society. The site was created to introduce ourselves to the community and for our members to be able to communicate with each other electronically. This website will inform people about the club, offer ideas, and list upcoming club events and activities. Feel free to look around. Please let us know what you think. On this home page, we'll introduce our club and give some examples of the types of activities we're involved in. We'll also introduce you to some of the members and officers of the club. These are the people who make everything happen. 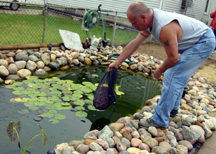 The Society has a vast wealth of knowledge to share with you, about ponds, water gardens, and fish. 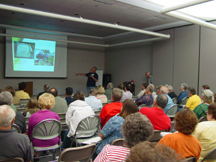 The monthly meetings are on the second Saturday of each month at 9:00 A.M., except on special occasions to accommodate speakers and special events. The meeting locations are different each month. We meet at businesses as well as at club members' homes. The club does not meet or publish a newsletter in December or January. However, in early February members receive the first newsletter of the new year. This newsletter announces where the February meeting will be held. Remember to bring a lawn chair to the meetings. The meetings begin at 9:00 and last about an hour, unless a special event is scheduled. 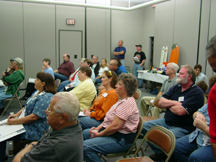 Occasionally, guest speakers who specialize in specific areas are invited to share their knowledge, and answer questions. 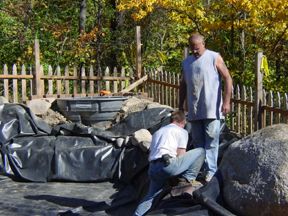 The Prairieland Koi & Pond Society installed a pond and wet land area at the Zoo in August of 2001. We continue to care for the pond on a weekly basis. 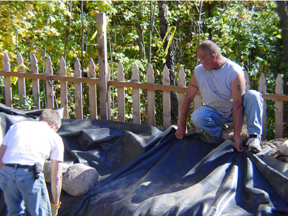 Volunteers weed, mulch and take general care of the surrounding area of the pond, as well as maintenance on the pond and bog areas. Ron Carter is the member in charge of the Zoo pond and can be contacted at 657-9297 or emailed at pndguy@sbcglobal.net for information on volunteering or donating fish or plants. He does a remarkable job organizing his volunteers and taking care of the emergency situations that come up. to put in the Bio-converter. The club performs various other water gardening projects. Some of these projects include: retirement homes, helping club members with their ponds, and participating in various programs for the public. Watch the newsletter to learn of these upcoming events. Help us help others. 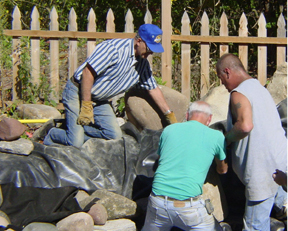 The next series of pictures show some of the Executive board helping a club member install a large koi pond. This group of guys decided to lend a helping hand and at the same time put to use some advanced pond techniques they picked up at seminars in Pond building. Moving rock is always labor intensive, but with 4 strong men, the job is accomplished faster.